Usually when I buy bananas, I end up buying a dozen of them. They come home with me and sit stubbornly in the fruit basket, as if gesturing to stay away for a few days till they ripen. And ripen they do, all together, making me wonder if they take a silent pledge of equal fruition. Almost always a couple of these bananas, specially the ones that stay at the bottom of the pile, end up getting ignored, and they seem to vehemently make this clear by quietly changing colour. That, ofcourse, is not an excuse to bake this cake. 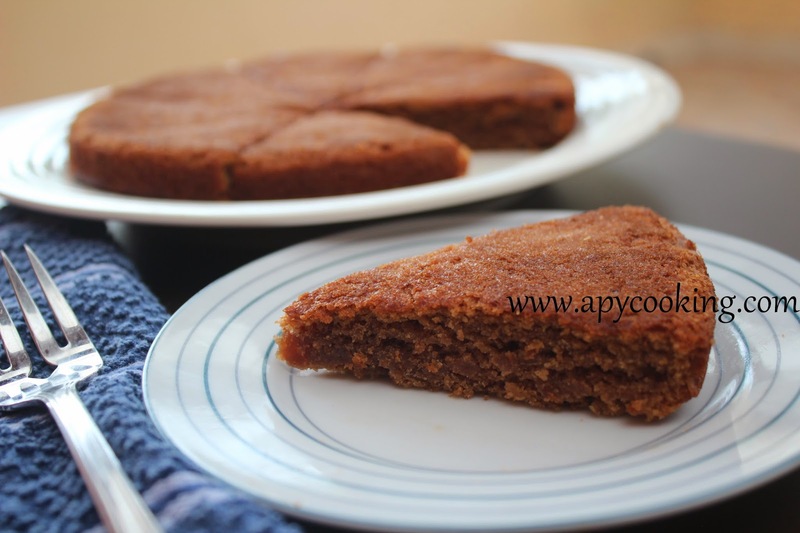 Infact, I made this cake just as the bananas ripened, because I was waiting to lay my hands yet again on my new OTG after the delicious outcome of my earlier experiment - Eggless mini mango muffins. 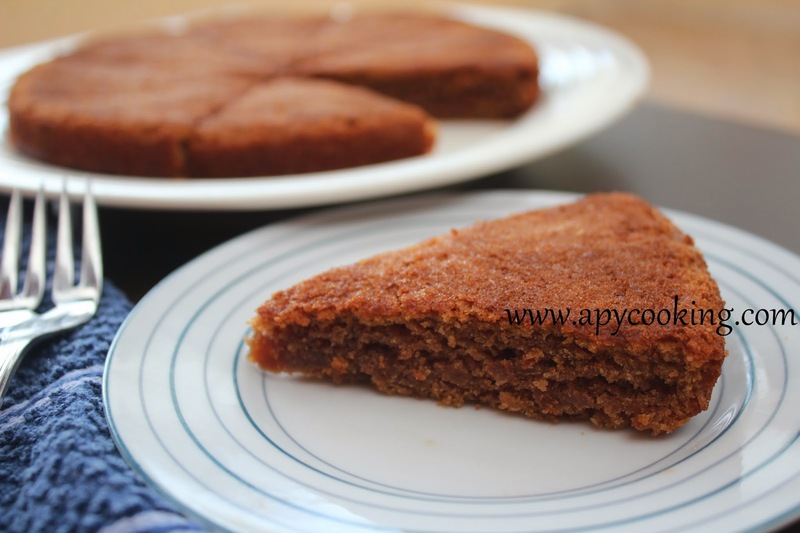 Just like the mango muffins, this is an eggless cake that comes out soft and light. So here's the recipe. It's easy to make with ingredients probably available in your house right now. Roughly chop bananas and blend with sugar and yogurt for about 20 seconds to get a smooth paste (there shouldn't be any banana chunks). Transfer this paste to a large bowl. Add oil, mix gently till you fold it in and then mix thoroughly. Add salt and baking soda and mix. To this add maida little by little mixing as you add. Mix thoroughly, scraping the sides, and get rid of all lumps to get a nice and smooth paste. [You can use an electric hand mixer]. Make sure there are no lumps and that all ingredients are mixed really well. Line a baking tin with parchment paper or grease it well with oil. [ Use a 7" round tin. I used 8" and the cake became thinner than I'd have liked]. Pour the cake batter into the baking tin. 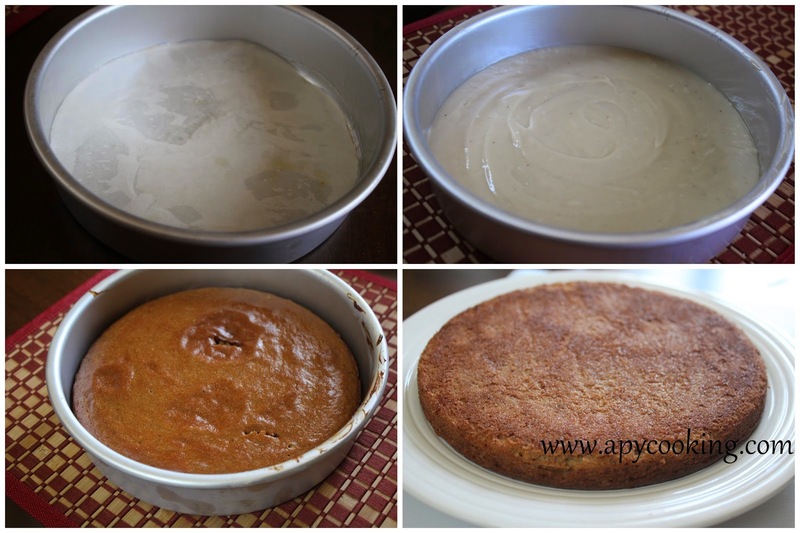 Bake for 35 minutes (+ or - 5 minutes depending on the oven), till a fork inserted in the centre of the cake comes out clean. Allow the cake to cool. Invert the cake (gently peel off the parchment paper if you have used it). My husband's serving suggestion - have this hot with ice-cream. Sounds yum! Mango is such a divine fruit. Mangoes are pulpy, juicy, sweet, luscious. Their bright orange-yellow colour plays with your eyes and their succulence makes them totally irresistible. 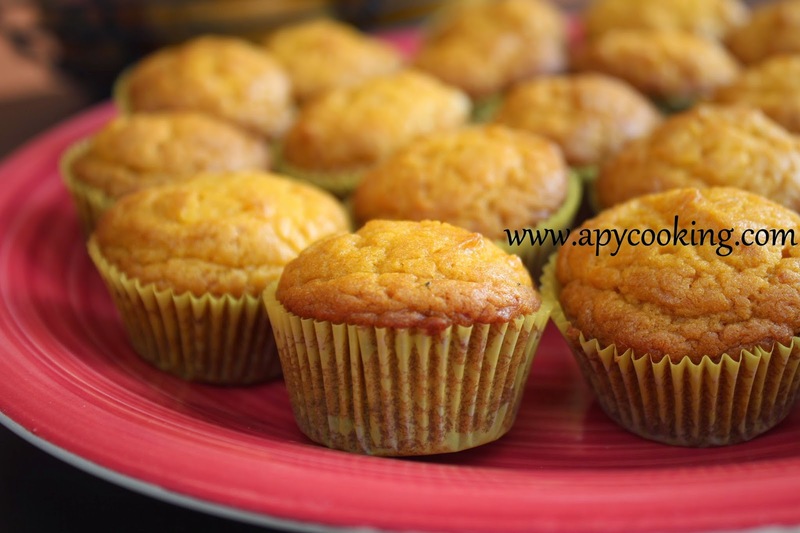 Here's an easy, eggless recipe with easily-available ingredients to make mini muffins out of these delicious mangoes. I prefer mini muffins to muffins because they are smaller, good for a quick bite and can be very appealing. If you don't have a mini muffin tray, you can use a regular muffin/ cupcake tray (baking time will increase by about 10 minutes), but I would urge you to get yourself the mini muffin tray. A few online stores seem to sell them. 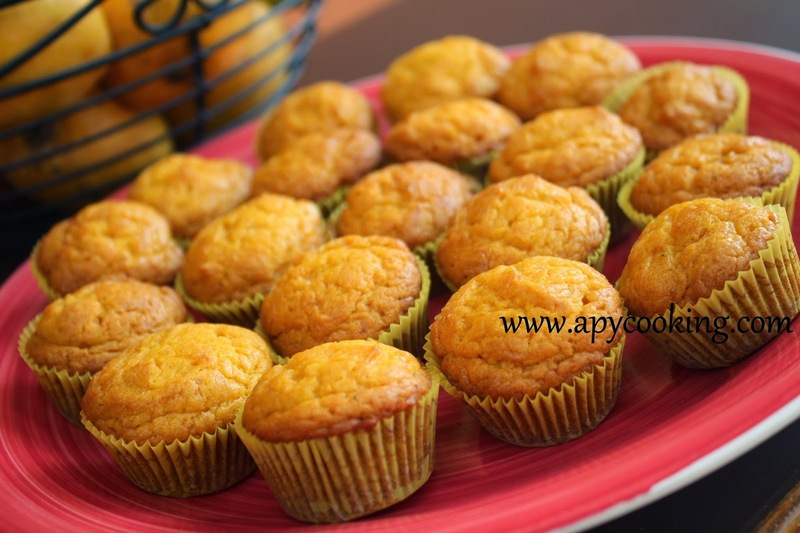 Mini muffins look very cute and you can serve them at a party or take them to your friend's house or to your child's play date and they will be immediately liked. You can even slip one into your child's tiffin box. 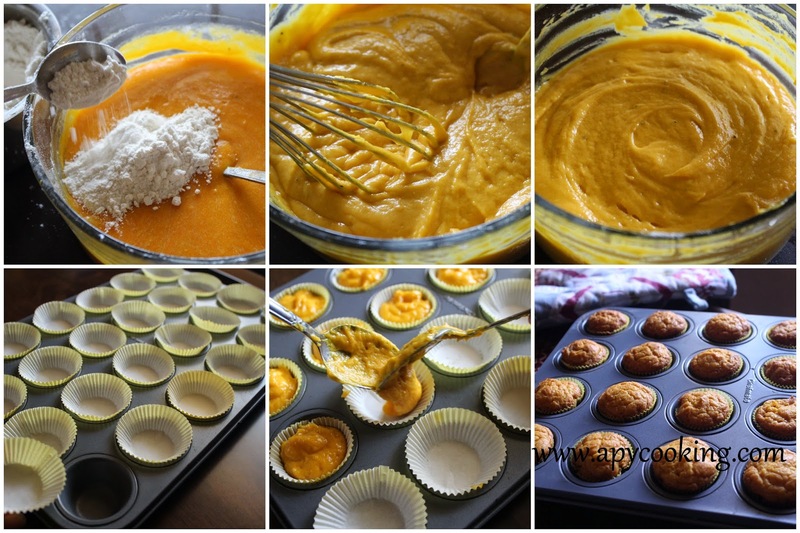 - I used 2 regular sized mangoes for the pulp/ puree. For best results use ripe and sweet mangoes. - All ingredients, specially the mango, should be at room temperature. In a bowl, combine maida and baking soda and keep aside. Discard the skin and blend cardamom with sugar for about 10 seconds. Take this powdered sugar into a large bowl. Add ghee and mix well. Get rid of lumps. 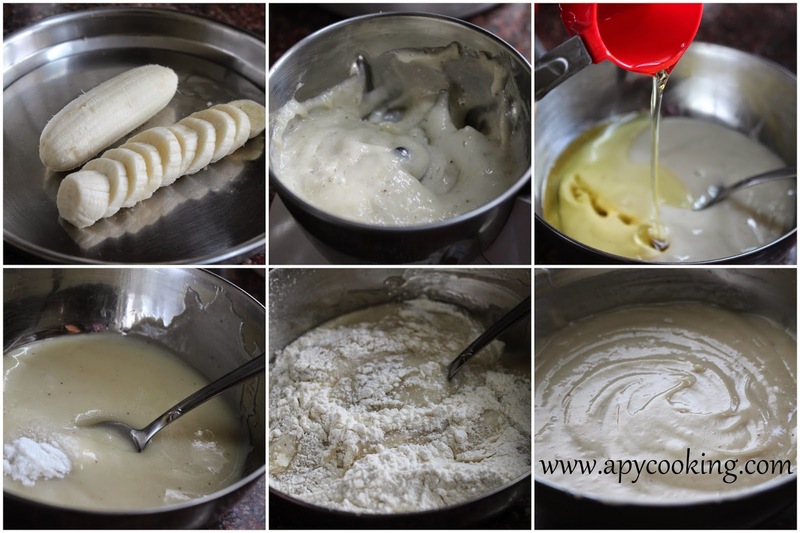 To this add curd and mix thoroughly. Get rid of lumps. 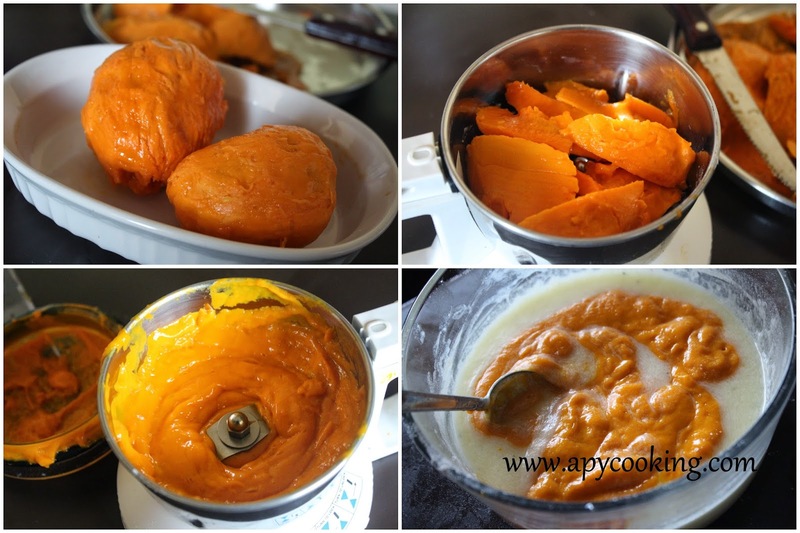 To make the puree, chop mangoes roughly and blend for 10 to 15 seconds or till you get a fine puree. Measure out one cup [You may need more mango depending on the size. ] Add puree to the above mixture and mix really well. Get rid of lumps. You don't want any lumps. To this, add the maida+baking soda little by little and mix thoroughly [ I used my handheld whisk. 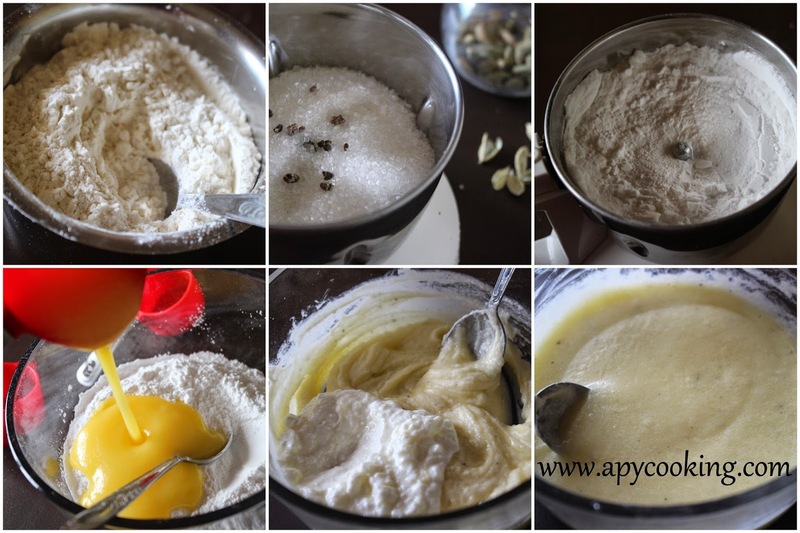 You can use an electric hand mixer to get a smooth mix.] Make sure you get rid of lumps. The batter should be smooth and lump-free. Preheat the oven to 170˚C or 340˚F. Line a mini muffin tray with paper liners. If you don't have a mini muffin tray you can use a regular muffin tray. The baking time will vary. Using two spoons get the batter into each liner till it's 3/4th full. Bake for 16 to 18 minutes, till the muffins are done and a fork inserted in the centre comes out clean. Allow to cool. 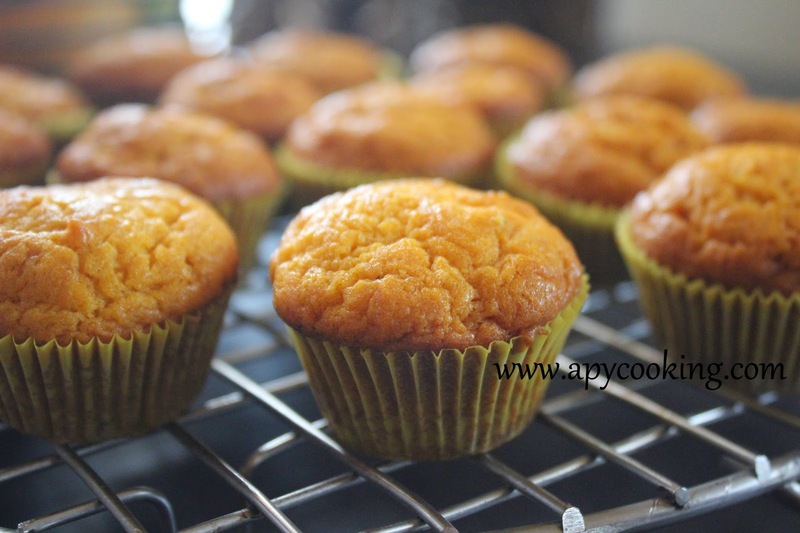 You can frost these muffins and make cute cupcakes out of them. [If you are using a regular muffin tray and you realise only later that the inside in still a little sticky, then refrigerate the muffins and they should be good after an hour]. Enjoy these cute treats with your family or friends!